More info, pictures and prices! You've got that new truck and now is the time to think about a truck bed liner before you have to haul anything that will scratch it ... and almost everything does! Don't wait until its to late. You have quite an assortment of bed protection available. 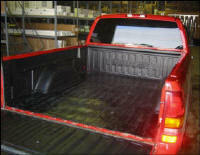 Truck bed carpet liners is an option that most people think is for "light duty". This is not true with Bedrug by Wise industries. Its impervious to gasoline, motor oil, bleach and battery acid. These pickup truck bed liners can be pressure washed if they get dirty and probably best of all ... easy on the knees! They are form fitted with marine grade carpet laminated to closed cell foam. The bottom part has groves cut into the foam to match groves of you bed making it lie flat for the smooth look. Want the "best bang for the buck"? What about a bed mat? These thick tire-like mats are indestructible ... and for the money ... the best value in truck bed protection AND they don't rub the paint like a drop in plastic will. They are form fitted to the bottom of the bed and you have the option of a tailgate mat (same tire-like rubber) or you can get the tailgate piece of a plastic drop in separately. The plastic piece wont require nearly as many hole to install. Most use the factory holes. The drop in truck bedliners do have some advantages. For one, these polyethylene liners give you protection from cargo falling onto the sides, front and tailgate areas. They are especially good if you are hauling things like propane bottles and other cargo tha tend to roll around and can dent the sidewalls. Most brands have a "non slip" style which costs a little more but helps keep your cargo from sliding. The drop in bed liner is good for heavy duty use especially when you're the type to throw a lot of stuff in. These types of liners are expensive to ship. They are to big to go UPS and have to be shipped "common carrier". They will rub the paint over time due to the vibrations of driving. The paint damage can be cut down quite a bit with a "paint saver pad". This is a thin closed cell pad the you lay in the bed under the liner and it absorbs the rubbing and is quite effective. Now for the "best of all worlds" comes the new "Dual Comp". You have the thick rubber mat on the bottom and the molded plastic to protect the sides, front and tailgate. These liners are "modular" and can be shipped UPS or DHL right to your door and you can install them in about 3 minutes! No paint damage, no sliding cargo and easy on the knees! Want one you can do it yourself? You can have the look of a sprayed in liner with a roll on liner you DO YOURSELF. Whether its a Dodge, Chevy, Ford or Toyota protection it is well worth the investment. The NADA buyers guide lists a liner as an "add on" value that is worth some money come trade in time.